Belle de Boskoop was introduced in the 1850s in the Netherlands, and is still popular on the Continent. It is a large, lumpy, dull red apple, often with extensive russeting. There is also a modern "sport" with a darker red colouring but otherwise quite similar. 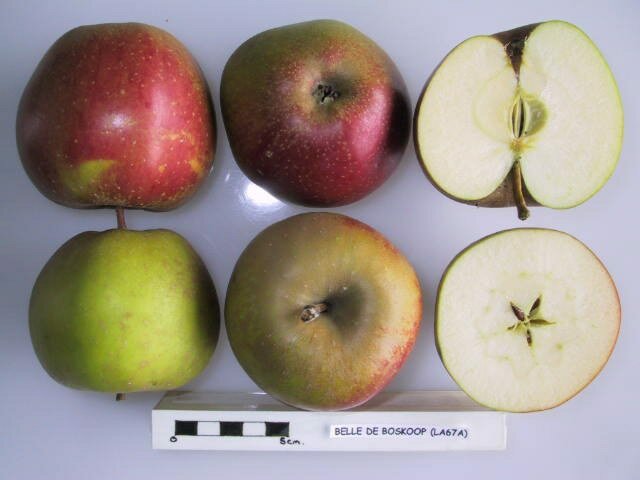 Belle de Boskoop is essentially a dual-purpose apple, suitable for both dessert and culinary uses. It works equally well in a savoury salad, or can be used sliced in continental-style apple pies and flans. 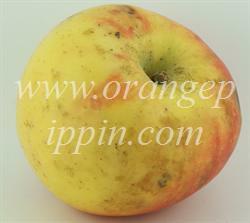 Unlike the English Bramley cooking apple, Belle de Boskoop keeps its shape when cooked. Eaten fresh, Belle de Boskoop is quite a sharp apple. This and its large size makes it unsuitable as a snack apple, but it can be nice cut into slices to share after a meal. The white-green flesh is dense with a very firm texture. In summary, a versatile and unusual apple variety. Hello From France...I'm originally from Vancouver, and lived on Vancouver Island where I had a friend who grew Belle de Boskoop apples. Glad to have found them in Europe as well. We just planted an espalier tonight in our little garden. It'll be fun to harvest and make apple crumble. Happy growing everyone! How d'ye like THEM apples? This is a true classic, a country apple best fresh off the tree in the mid-to-late autumn. Looks like an apple, smells exactly how the apple of your dreams smells, and the taste is like reliving your childhood tastebuds, why you liked apples in the first place. Support heritage growers! Red Belle de Boskoop (Raintree Nursery) is easily the most productive tree in our small orchard. It reliably produces annual crops of 4 bushels per tree on dwarf rootstock. The fruit are huge and nicely russetted (it helps to thin the fruit). The flavor is delicious and tart with lots of juice -- a great addition to cider with other varieties that add a bit of sweetness. The fruit is almost too hard to be a good eating apple, but great for baking and cider. It produces a lot of foliage and leaves, so you need to keep up with pruning and control the top growth, unless you have a very long ladder. My full sized B. de Boskoop tree bears the low-colored fruit, yellowish with a little red blush with sun exposure and moderate russeting; not like the red Boskoops seen on the store shelves. This apple is quite sharp and, as such, cooks to a fluff and is delicious cooked with boudin noire. David Chambers of VA: seburn.patrick@gmail.com is my email if you want to chat about Boskoop! From David C of Northern Virginia: Comments: Patrick W of NW Virginia: Would love to get in touch to talk about growing this tree. Filip Fransen of Antwerp: My all-time favorite, too! Orange Pippin: Contrary to your vitamin detail, Wikipedia cites journal which states the Belle de Boskoop has four (4) times more Vitamin C than either Granny Smith or Golden Delicious -- see https://en.wikipedia.org/wiki/Belle_de_Boskoop#cite_note-1 All: "Red Sport" grows well in Lower Normandy, France. There, the apples are mostly large, excellently crisp and crunchy, puckeringly sour, and highly aromatic. (I was surprised to read of Piet's unfortunate experience in Belgium: condolences.) General question: Where in the U.S. can one obtain Belle de Boskoop trees to grow? Got my first crop, 50lbs, on M7 in about 4-5 years. Beautiful large blossoms. Fantastically flavored sweet/tart huge russet apples. Apparently THE apple for strudel, but made a spectacular apple pie. Highly recommended. I have 43 trees on bud-9: vigorous crazy grower, definitely Triploid, awesome flavors, regular bearer. No scab, no bugs. Eating and sharing this mid-march. These have followers at the market and boxes are shipped to those in the know. W Washington/cool growing is the best! Like a fine wine grape it varies season to season. Most years it's amazingly complex, rarely flat, occasionally a love affair, an apple virtuoso. I make custom trees, and supply scion. This is one of my favorite apples. For me, it's a heavy bearer, I have to thin it pretty heavily in early summer. The apples aren't too big, but there's lots of them. It's the best cooking apple I've ever seen. After harvest I can a bunch of them as apple pie filling. I can take the canned apples out of the jar, put them in a pie and bake the pie and when eaten they still have a firm and solid texture to them. I've never seen another apple that didn't fall apart with that treatment. They're also good keepers. It's the middle of February and still eating them out of storage, just kept outside in my shop, no special care. The texture is still good as is the flavor. Highly recommended. I have had an Apple that the farmer called....Bos de koop.....he was from Sequim WA.....please tell me I am not losing my mind....Best pie apple ever. I have several small apples trees in my garden. In comparison to the others, the belle de boskoop or schone van boskoop, (the Dutch name) was a disappointment for me: irregular production, susceptible to scab, and not to my taste. The most positive point is that they keep long. Alan, Picking up "The Best Apples to Buy & Grow" for the first time in a couple of years, I noted this about BdB: "This apple is moderately resistant to scab, resistant to canker and very resistant to fire blight." That, written by Ted Swensen, past president of Home Orchard Society, in Oregon, USA. I'd forgotten about this sterling endorsement. I have sampled it; an excellent apple. I'd appreciate hearing about any disease issues, especially in comparison to more well-known varieties (i.e. more or less susceptible to scab than McIntosh; any disease comparisons relative to Golden Delicious). Thanks! I think people in the States rely too heavily on loads of cinnamon (probably cassia, much sharper than true cinnamon, and not expensive, but that's how things are here) when cooking with apples. I use coriander. It seems to compliment any tartness and complexity in apple flavors. My Belle de Boskoop also came from Raintree Nursery, and it grows espaliered along the border of my small city lot. It bears very well - this year, despite our terrible spring weather, it bore at least 100 apples. I am wondering about texture. While previous posts commented on its ability to hold its shape when baked in a crisp, I have found the opposite to be true. Any comments? Suggestions on how to spice the applesauce? I am reasonably sure BdB is triploid; John Bultitude comes to mind, for one source. I cannot confirm it by personal experience as yet, but I hope to graft it next spring and find out! Belle de Boskoop is one of the best, most delicious apples ever! There is no other with all the qualities it has: great taste, firm flesh, long keep... and just imagine this: in Paris (yes Paris, France, not TX, lol), these apples are sold in high-end delicatessen stores by the individual unit!! And they sell for about 5 bucks a piece! We French know what's good, trust me! I am right now hunting for a tree to plant in my yard. I hope I can find a place that has them available! David Smith in Yorkshire: I have read repeatedly that Belle de Boskoop slices retain their shape when cooked. That may be another indicator of your cultivar. We have the Red Boskoop sport we ordered from Raintree Nursery. It has done well here in Southern California despite our mid-fall heat; sweet/tart with a good crunch and lots of juice. The appearance is lousy but the flavor is heavenly. I hope to bake a pie with it next year. I fondly remember this apple variety from my childhood. We'd get a whole crate of Boskoop in October and store it in the cellar till Christmas. I loved the tartness of freshly picked apples and the sweetness of the slightly shriveled ones from the cellar. They would last throughout the winter. Every time I let a Gravenstein go too long and bite into mealiness, I long for a Boskoop. I particularly like the russet skin. My teeth are allergic to the glossy texture of most apples. Boskoop is heaven to me, and the only apply I can bite into whole. We own BelleWood Acres and grow Belle de Boskoops as one of our 16 varieties. The demand for them is growing yearly. They make the best pies and crisp. We call them our "Granny Smiths with attitude". they are tart with a great flavor. I have been looking at this variety for a couple of years. If one of the apple trees planted in my yard does not work out, Belle de Boskoop is the variety I want to replace it. My stock has all come from Raintree Nursery, in SW Washington, arriving in excellent shape. They carry the Red Belle de Boskoop, at overstock price this month. This apple tree is available from Fedco in Clinton, Maine. Search Fedco Trees and you will find their website. They sell mostly heirloom varieties. We think we have a Belle de Boskoop tree which was in the garden when we arrived. We seem to have the 'red sport' but also about 80% of the apples are normal size and only about 20% large as described above. Certainly our apples cook better than they eat, as it were, and are best left on the tree as long as possible. Ours will also keep well over winter. One thing which may help to identify them is that they go brown very quickly when cut or eaten. Does this ring any bells? Bellwood Acres just North of Bellingham has these apples available. I think they are great snacking apples and yes they do make the best applesauce. I also think they make the best apple butter. see October 7 Please tell Ramona from White Rock, BC there are many bags in the cooler and she may have some for the asking 604-576-7426 & Gord from Langley - the applesauce is great! I have a 7 year old tree I purchased from Garden Works in Burnaby, BC and this year was loaded, unfortunately one branch broke had so many apples on it. Is a nice tasting apple, skin is a bit peculiar due to russeting, but generally a nice eating apple. Apples keep on tree a long time, even during frosts and winters well in cool place. Great in pies or crumble type deserts. I have used these apples for pies for years. Being of dutch decent, they have been used by our family for years but not always easy to find. Do you still have apples available? very accurate description - now i know what these "different" trees are of which I have a dozen fully fruited trees. Unbelievable crop this year - now I need anyone to come buy and make use of them. Raintree Nursery, here in Washington state, has the "red sport" mentioned above, as far as I can tell. I found their website a couple of years ago, ordered four apple trees (Belle de Boskoop was my fifth choice - ran out of room). Raintree has excellent info and reasonable prices. My trees are on semi-dwarf rootstock and doing just fine. I have an ancient specimen of this variety in my garden. It was almost destroyed in a wild storm four years ago, but a fallen branch managed to cling on to the trunk, and is rooting independently where it fell. The apples have a crisp texture and sharp taste with mellow honey undertones. They are a bit too acid for eating, but as cookers they are hard to beat because they hold their shape well for pies and tarts whilst also suitable for making a lovely smooth homogenous sauce. This is a great apple, and I have the tree in my back yard, purchage some 35 years ago from Art Knapp Plantland owned by Bill Vanderzalm, cut branches are easy to graft on to other apple trees, as I have given away lots of branches and was told that the grafting was very succesful. the apples make the best applesauce ever, it's a winter apple, and the apples will keep in a cool place until spring time. To Pierre B. Wolf in Maine: I recently got one of these trees from Bob Hartman in Puyallup, WA . . . he has one or two left, and might also be able to tell you where he got his if he can't ship you one. Try b-jhartman@juno.com. Please, anyone, help me find this Apple in the US. John Field in Madeira Park, B.C. Peter Holmes in Cowichan Bay, B.C.